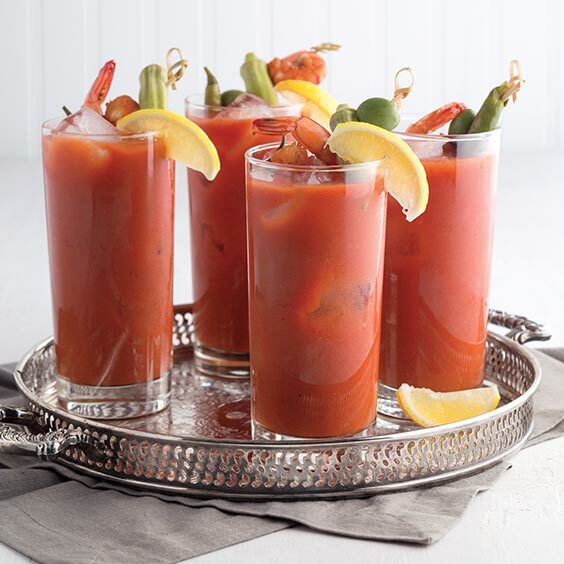 When it comes to the Bloody Mary, there are a few elements in the equation: acidity, texture, spiciness, and fixins’. When it comes to each of those areas, every Louisianian will have deeply set opinions on the matter. 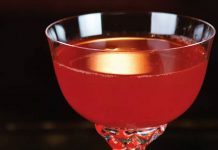 In search of perfection, we tested variations on each of those themes to come up with a bold yet approachable cocktail that will set just the right mood for your spring brunches. In a large bowl, make an ice-water bath. In a large pot, bring 16 cups water to a boil. Add tomatoes, cook for about 2 minutes or until the peel begins to come off. Remove from water, and place in the ice water bath. Let stand; peel tomatoes when cool. In the same large pot, heat oil over medium high heat; add onion and celery, and cook, stirring frequently, until translucent, about 5 minutes. Add garlic and tomatoes, gently crushing tomatoes with the back of a spoon until juices are released. Cook 10 minutes, stirring frequently. Remove from heat. In the container of a blender, add tomato mixture in batches, and process on high until smooth. Cover, and refrigerate up to 3 days. 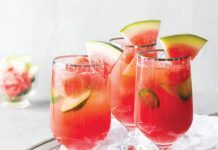 In a large pitcher, combine reserved tomato mixture, tomato juice, vodka, vinegar, celery, horseradish, anchovy paste, zest and juice, hot sauce, cane syrup, crab boil, onion, salts, and black pepper. Cover, and refrigerate overnight. Strain through a fine mesh sieve. Serve over ice with Pickled Shrimp, Pickled Okra & Fresh Ancho Peppers, Marinated Olives, and celery. In a bowl, whisk together vinegar, ½ cup water, honey, mustard, coriander, bay leaves, onion, and salt. Set aside. In a medium saucepan over medium-high heat, bring water to a boil. Add shrimp; cook until pink and firm, about 2 minutes. Remove from heat. Drain, and place hot shrimp in a jar. Pour vinegar mixture over shrimp; seal jar. Refrigerate up to 3 days. Place okra in a colander. Sprinkle with 2 teaspoons salt, and let stand 15 minutes. Rinse okra thoroughly to remove any residue. In a large heatproof bowl, place okra, onion, peppers, and garlic. Set aside. In a large saucepan, bring 3 cups water and vinegar to a boil over high heat. Add remaining 3 teaspoons salt and sugar, stirring until dissolved. Add peppercorns, stirring well. Pour hot vinegar mixture over okra. Let cool at room temperature for 1 hour. Place a plate on top of okra to keep it submerged; refrigerate for at least 4 hours before serving. Transfer to an airtight container, and refrigerate up to 5 days. In a medium bowl, combine olives, pickle juice, and pepper. Cover, and refrigerate up to 5 days. This is a lot of work and time but really worth it! We did a kid version with no vodka and they also enjoyed it. After straining the cocktail, we kept the mixture refregirated and did a soup with it few days later. We also made all the garnishes and ohhh…. they are soooo good! You could even just do the garnishes by themselves as an appetizer. They were a big win! 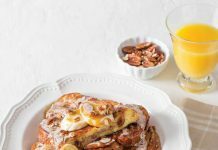 Thanks for these nice recipes!